We like it and want more. My best mattress ever (and I've owned high-priced Sterns & Foster). 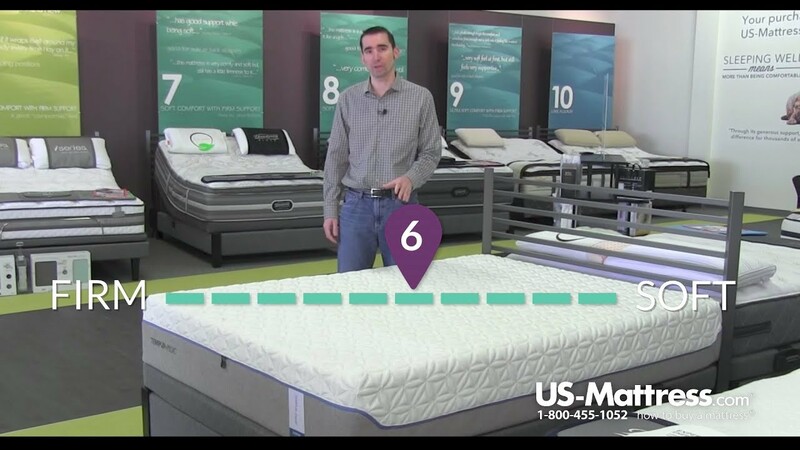 US-Mattress.com was also great--both in their advice and in delivery. Highly recommended. I had my reservations about spending so much money even when satisfaction is guaranteed. As we all know, returning something this size is not as easy as it sounds. But the risk was worth it. I have no regrets buying this bed. I sleep soundly and well. No more backaches! We bought the cloud supreme 3 weeks ago. It is very comfortable BUT I am waking up around 3/4 am very hot (never had a problem before). I am looking for suggests to help. I think the mattress protector doesn't help but without it if something happened then there would not be a guarantee. I have though of a mattress cover. Any suggestions. There is also a protector bedgear-Dri-Tec-Xtreme-Mattress-Protector , anyone try it? I have had pain in my joints for years! The first night after sleeping on this bed, I woke up refreshed and pain free. My pain is due to hypermobility, so joint support is major in preventing painful hyperextension. When I bought this bed I was extremely hesitant on making such a large purchase on a bed that I hadn't spent more than 10 minutes "trying out". I've read time and time again how memory foam beds can cause back pain, excess heat, ect., I've NEVER been more pleased with a bed. I worried at first that this particular bed would be a bit too stiff for me due to frequent back pain, but within a week I noticed not only No back pain, but an amazing night of sleep. I've honestly never felt so refreshed in the mornings! my one and only regret is getting the queen size instead of the King! I bought a queen-size Cloud Supreme three years ago, shortly after my parents bought the king-size version. It was one of the best decisions I've ever made. The only issue I have is that it gets warm in the summer, and I'm a warm sleeper, but keeping a fan on by the bed is enough to keep me cool and comfortable. I cannot recommend this bed highly enough. We brought the Tempur-pedic cloud supreme mattress about 6 weeks ago; With a new mattress we knew it had a strong "new smell" like a new car; however it was a very strong smell giving off gases from the foam; smells like contact cement or wet glue; something you don't need for a good night sleep; six weeks later the smell is still there; need to return it. We bought our mattress about 6 weeks ago, and couldn't be more satisfied. I have a job with a lot of walking, & bending over. I used to hurt everywhere, but, now, I get out of bed with no backaches, & less leg pain. I am a hot sleeper, & have had no problems with heat. We use a ceiling fan or AC. Both my wife & I were skeptical of paying a lot for a mattress, but now that we have it, we love it. I bought a queen back in Nov. I was involved in a car accident and had no luck finding a bed that I could sleep on comfortably at night, no tossing, no turning, no hurting and wake up refreshed and not hurting the next day. We looked at a Sleep Number before this. We loved the Sleep Number Bed. We also wanted to try out the Temper Pedic, because the reviews were also good for this bed. After reading reviews and trying the 2 beds out and weighing the pros and cons of both beds: worried that the Sleep Number wouldn't hold air, it might not function properly later in time and the price of parts if they stopped working right. Tempur Pedic didn't have pumps, didn't get a chance of holes in the mattress like Sleep number, didn't have parts to replace, didn't wonder if it would lose air at night. When we tried the Tempur Pedic out at the store, we liked it too. So we bought this instead (due to the pros and cons list) of the Sleep number, (even though I thought controlling how the bed feels each night would have been awesome, because every night you go to bed feeling pain somewhere different or sometimes just want a firmer or softer bed). The first 2 nights were great! Then after that, It was terrible. Tossing, turning, sinking into the bed, it held heat (they say it adjusts to the room temp, so keep it cooler in the room, but it doesn't help once you lay on it! ), very hard to get out of after laying or even sitting on it for 3 min. You sink, it doesn't not mold with your body. When you lay on your stomach you curve backwards and it was so uncomfortable. You can't lay on your side without neck and back pain. Laying on your back is pretty much the only way to sleep on this bed and even then, it is so hot and you have a lot of trouble getting out of it. Then it comes down to intimate time with your spouse. Forget it. You sink and you just can't on the bed. Not to mention, it gets too hot! The bed looks comfy, but it fools you after a few days. I was told we had a sleep trial for 90 days. Each night I thought o.k it has to get better, right? So we just kept waiting for it to get better. After my 90 days were up, we thought o.k well now we're stuck with this bed. Yes, it was my fault, because we should have said No, done with it sooner, but like I said, it has to get better. Still stuck with it and I know we can't sell it for the price we paid for it and we know no one else will want this bed. Ugh frustrated and learned a lesson. We bought this mattress because we were told "it's the Cadillac of all Tempur-Pedic beds". We tried it out at the store and it seemed to work great. We brought it home and I continuously wake up on a flattened mattress every morning. We though a hose was leaking so we called Tempur-Pedic and after much discussion finally got them to send us a new bed (the same version). Well that was last week and I STILL wake up in a hole every morning. This is the absolute worst sleep I have ever gotten. This mattress is a glorified air mattress. Don't waste your hard-earned money on this. Stick with the regular tempur-pedic mattresses. 19 days into it and we are disappointed in the hardness and lack of "give" in the mattress. In addition, the odor given off by it is almost excessive. Going back to see what alternatives there are and decide if this is actually the brand we want to buy. Oh, and the price in the store was $400 more than the one online...? I've had this bed for about 6 months now. I used to wake up with back pain every morning on my old mattress. That pain continued with this mattress for about two weeks and I was quite disappointed my pain did not disappear overnight. After about a month, I was talking about his back pain and I suddenly realized that I was no longer waking up in pain. It had just kinda went away slowly that I hardly noticed it until it clicked. It does sleep a little warm, but I turn the ceiling fan on and I don't really notice it. My friend ended up getting this bed on my recommendation and he also loves it. Honestly, the only other downside to this bed is that when I'm not sleeping in it, I miss it. Delivery was a bit of a pain since I was trying to get my mattress around 4th of July weekend. But once I got it and broke it in, my Tempurpedic Cloud Supreme became super comfortable. I love sinking into it after a long day and knowing that once I plop down it won't be long before I am out. My only complaint is that it can get a bit hot at night when I sleep. I've been able to handle it though with my fan. I'm just wondering how long this mattress takes to break in? It is definitely firmer than I expected. I am a side sleeper and have a hip injury that I was hoping would be helped with the tempurpedic, but it doesn't have a lot of give. I might be better off with the elite or the luxe?? I had slept on a friend's Tempur-Pedic bed while house sitting a few months ago, and I was hooked. I had tossed and turned ever since on my aging coil-spring mattress, and finally bit the bullet and purchased the Cloud Supreme model from a local retailer. After the first night, I already noticed a huge difference: I woke up in the same position, and with zero stiffness. Weirdly enough, I also woke up REFRESHED. To my new bed's credit, I didn't feel like I had to lay there and "wake up", I was ready to go and had no back or hip stiffness. Fantastic bed! I bought this bed over one year ago. . I have a history of fibromyalgia, and back pain, disc ingurys and three neck surgeries. The bed is soft, comfortable, while,giving me support. I went from getting only two hours of sleep, to sleeping through the night.,This has been a miracle for me! I did not have an odor issue as it dissipated quickly. In dealing with multiple health issues, including fibromyalgia and sleep apnea, good sleep is imperative! After trying several different types of beds over the years, I've found the Tempur Pedic beds the very best! I fall asleep quickly, don't wake up in a sweat, my spouse can toss and turn all night without me ever feeling a thing, and sleep the whole night! I haven't seen bags under my eyes once since I bought the first one 7 years ago. This Cloud Series is my second one and it is just as comfortable as the older one and I expect it to still be this comfortable many years from now just like my first one. It's wonderful! I have had this bed about a month now & love it even more each time I sleep on it. The breeze technology evenly distributes the body heat so I never get hot (and I am a very hot sleeper!). And no matter how many people are sleeping in the bed, if one gets up no one else is disturbed. The new bed smell dissipates very quickly (within a week). I no longer wake up with the aches & pains associated with improper support. I cannot say enough good things about this bed! Was concerned about spending so much on a mattress, but I'd do it again in a heartbeat. I'll never sleep on anything else now. We have a Queen size Tempur-Pedic that we've used for over a decade but finally made the upgrade to a California King and wish we would have done it years ago. The new Cloud Supreme is softer, more supportive, and body conforming that our old Tempur-Pedic and is worth every penny. Go big, you won't regret it. I have always had a twin sized bed. But at 6'2, I finally decided I needed a bed more fittting for my size. And for me, there was no other option but Tempur-pedic. My new Cloud Supreme has been the best investment in my adult life, and I recommend it to anyone considering a new bed and their best nights sleep ever. This is the best bed I have ever slept on. It is just the right level of softness. It contours to my body perfectly. I am a stomach sleeper and I no longer have pain in my ribs an such. I am also hoping to end my Chiropractic visits for my ongoing neck and shoulder tension. The adjustable frame is a sweet bonus as well for watching TV and reading... so cozy! I've been sleeping on my new Cloud Supreme for about a month now and every night it seems to conform and support me better than the night before. I awaken refreshed and sleep through the night much better and more often than I did on my previous mattress. I never knew sleep could be so good! We've had our Tempur-Pedic bed about two years and I never tire of the luxury of sleeping on it! It's firm yet cushy, and gives wonderful support. We have the split king also allowing my husband to elevate his head---much improved sleep apnea and snoring!!! Alleluia!! Have had great sleep and do not disturb each other when we turn over or leave the bed. My wife and I have been married for 43 years. We have had the bed for just over a year and have never had better nights. We both suffer from GERD and sore joints. The bed has been a major factor in controlling both. I wish we had found this system years ago. We Love this mattress. Hate to get up in the morning. We have already convinced two of our friends to buy a Tempur-pedic. If I were to do it over, I might go to the next level of firmness, however, I am fine with this one. I have multiple physical problems such a as arthritis and back problems. Trying to sleep use to be a nightmare. Now I don't want to get out if bed. My shoulders no longer hurt to sleep on my side and my back does nor hurt when I get up. Best bed in the world. I have had this mattress set for 6 months and I would never give it up. I tam a road warrior for my business and can not wait to get home to my Tempur-Pedic. I am so glad we purchased this mattress. I can now sleep through the whole night & get a perfect night's sleep. Highly recommend. i got a great deal on my bed. Its the best bed that i have owned. My back pain and insomnia are gone forever! Once you get past the soft cloudy surface you settle into this amazing support section that is the key to the whole idea I think. So happy to finally own one! We have another tempur pedic, but bought this one for our spare bedroom it's hard as a rock doesn't seem to break in. The man at the store said it will after time! How long I don't know! I bought a contour supreme first. Kept it 3 months and had back and shoulder problems entire time. (Ironic because that is why I selected the Tempu-Pedic in the first place because of degenerated disks in my back). I exchanged it for a Cloud Supreme II. Have had it 2 weeks and it still reeks of some kind of chemical. Couldn't sleep on it at all for two days. I thought the smell had been eliminated, but I can still smell a faint odor every night when I first get into bed. My husband said it felt like sleeping in mud. I put another cover on top of the protective cover to help with the mud feel. It helped somewhat. I've washed all bedding two times to try and eliminate the smell. The Cloud is softer and doesn't hurt my shoulder as much as the contour. Sometimes you just have to admit that you made a mistake and move on. Maybe it will get better. The only good thing about it is I can raise the head and foot when I need to. We Love Sleeping on a Cloud! We bought this mattress about a month ago. After shopping for several weeks and comparing several different mattresses we decided that the Temper-Pedic Cloud Supreme was our favorite. It was more money than we wanted to spend, but we have been so unhappy with the last 3 mattresses that we've owned that we wanted to be sure to get something really good. We are not disappointed. It is so comfortable, I can't wait to go to bed at night! We just love, love, love this mattress. I would highly recommend it to anyone. We now have three Cloud Supreme mattresses in our home. We're all sleeping very well and very happily. It's OK. It takes some getting used to. Honestly, I prefer my 15 year old spring mattress to this. I really don't think the cost of a tempur-pedic is worth the level of comfort I got. A night of sleep you can't afford to miss! This is my second Temper-Pedic Cloud Supreme purchase in the last 12 months. Nothing wrong with the first, I bought a second one for my house. I wanted a king size, so the queen is now in the guest room. I have significant back problems which have resulted in multiple surgeries and back related procedures. Following my second surgery, I purchased my first Cloud Supreme mattress. Over the first 90 days, I was completely sold on the benefits of Tempur-Pedic. My nights of sleep became more restful, my need to adjust due to discomfort was almost completely eliminated, and I woke up feeling better than I ever had in the preceding 3 years. The way this mattress forms to your body and supports the spine is completely different than anything I had experienced on countless conventional mattresses. I upgraded my bedroom suit, but didn't want to lose the great nights of sleep I have been getting, thus the second mattress purchase. If your looking for a mattress that will completely improve your quality of sleep, level of comfort, and ultimately even your quality of life......you can't afford not to give the Tempur-Pedic Cloud Supreme a try. You will not regret it. We bought the bed in July 2014. It is expensive but worth it. We have had other memory foam beds, but none compared to this one. 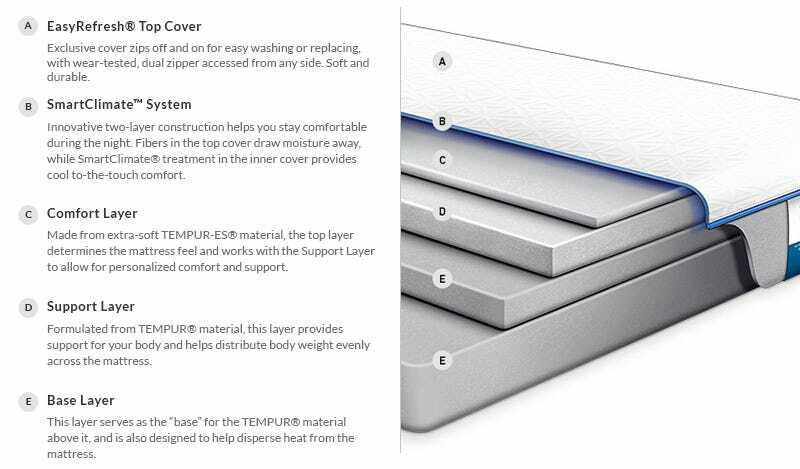 Bought a couple of months ago having used Tempur-Pedic products before and was not disappointed! This bed is so comfortable that I usually fall asleep within 10 minutes. I have sleep apnea and mostly have to sleep on my back, not a problem with this mattress as it hugs you and adjusts to your bodies contour. I bought the Cloud Supreme, hoping to get some relief from back pain and more restful sleep. I find it to be not nearly firm enough. We have thought about Tempurpedic for quite some time and on Labor Day finally bought one. We love the mattress. I used to have some problems with back aches and they are gone. We also love the adjustable base. My wife likes the massage, but I really don't use it. We did disagree on having a king mattress or two twins, so that we could adjust the base individually. We ended up getting the two twins and I wish we had the king, simply a preference. The only negative is the smell is worse than what we expected. It took 4-6 weeks before it was gone. Luckily we could open the windows to air out our bedroom. It seems that you could come up with a process to eliminate the new mattress smell of memory foam.